5 hours into my 34th summer, i woke to the sound of waves crashing beneath me, and birds chirping in the distance. 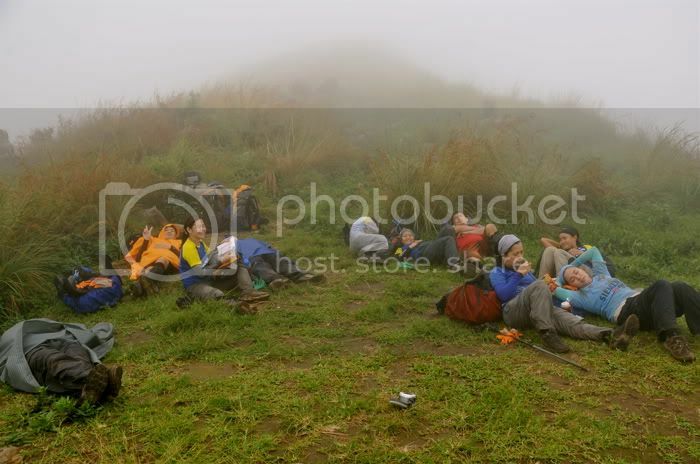 i saw a hint of sunrise in the horizon, and i felt a little rotten having slept on 4 monobloc chairs, wearing a pair of damp speedos, my stinky trek shirt, and my still wet trekking pants. a few hours previous, i had very quickly changed back into my trekking attire after having already bathed and relaxed, eager to return to the trail to find 11 people out of 79 who were still on the mountain. it was just a stroke after midnight, which marked my birthday, and i had already treated everyone to a bottle of beer. i myself might have had a little too much to drink because i accepted the offer without hesitation. i had already paid for a third case of SML in anticipation of the arrival of the stragglers, and as the new day grew older, it seemed apparent that the beers would be warm by the time they showed up. 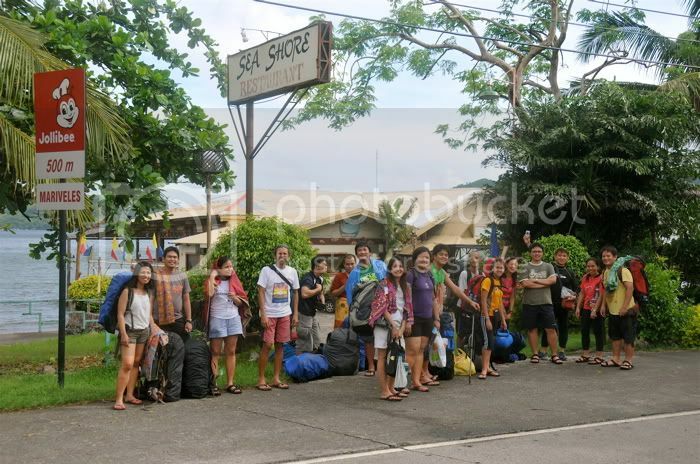 celebrating my birthday at the seashore restaurant in mariveles, bataan was certainly not part of the plan. i was expecting to be in manila, enjoying the national holiday, probably having dinner with my parents, then a few drinks with friends afterwards. but things have a way of going awry, and it all began late friday evening. from my place in malugay, joven, princeton and myself walked to the ayala tower 1 passing through salcedo village. 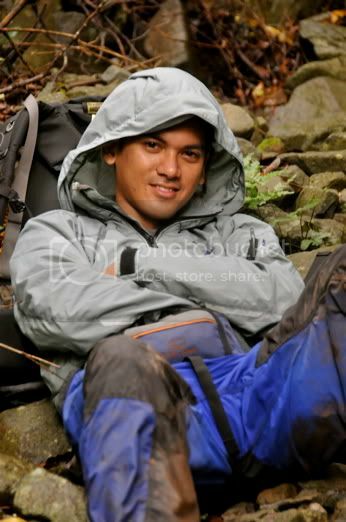 it was 2kX's second training climb at the mariveles mountains, and we were planning on an early start. sky biscocho plotted an epic trek by threading 3 separate trails which could themselves be overnighters. it was designed to trump all other climbs, including 2k5's now legendary 24-hour trek, and 2k6's 15-hour ordeal on the river. apparently, someone had told sky to bring it on, and this was his idea of bringing it. i looked at the itinerary and bemoaned the inevitable: night treks for most people. the climb hadn't even started yet and already i was complaining. what purpose does it serve to compound the challenges we encounter in an already difficult mountain? we arrived at alas-asin an hour ahead of schedule, thanks to a bus driver that seemed possessed by the speed demon, and after munching quickly on half a sandwich, we were already walking towards the DENR outpost. our group was ahead, but our location relative to the actual start of the trail gave us a disadvantage and left us at the tail end. at the first choke point, my GL gave me instructions to "make a move" at papaya river. joven and i had already developed a strategy. veterans of several previous second TCs, we knew that sky's trails are fraught with bottlenecks: technical portions of the trek would force people to queue and linger, resulting in unnatural delays. we didn't want to be caught in that gridlock. 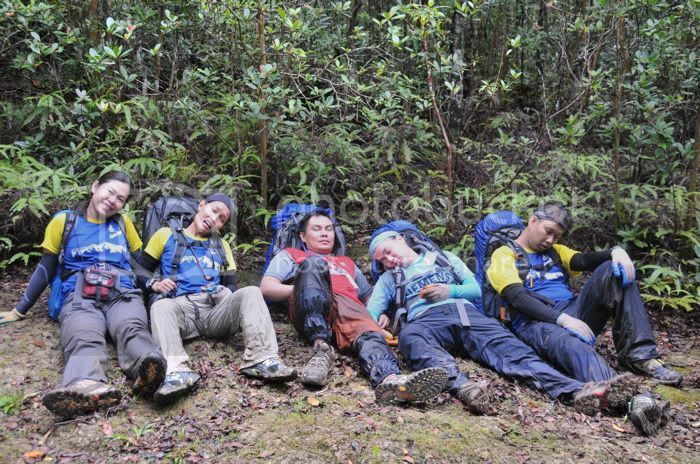 so instead of resting, i told my group to continue with the trek while many others chowed on trail food. bossing's group was still ahead of us at the beginning, but i found an opportunity to overtake them, by simply following the rules of geometry: the shortest distance between two points is a straight line. besides, it helped that i had eagle eyes and could spot trail signs from far away, even in the half light of the forest. 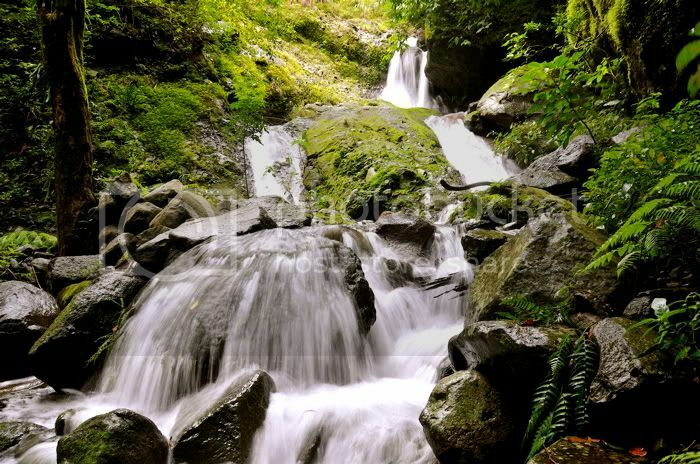 despite the rains that poured over luzon the few previous days, papaya river was a gentle meandering stream with mild cascades and smooth boulders. i managed to jump from rock to rock and ford through shallow portions without need for a rope. my group managed to follow me, the trainees including. before realizing it, we were already hot on the heels of the lead pack fixing ropes on gilbert's ascent. i called for a take 5, knowing it would only inspire sky to revise the trail if he sensed that the team was just behind him. a few individuals attempted to go ahead of us and i shot all of them down. we started on the ascent one by one, crawling up a steep vertiginous path that required all 4 appendages. this wasn't very long, and we reached one of the most enchanting portions of the trail leading to the sky-sam campsite well ahead of IT, and right behind the lead pack. we rested for a short while in a spot that opened to the heavens. the sun winked through the clouds above. afterwards, we proceeded to the SCAJ waterfalls, descending nat's landing, which was perhaps one of the most technical portions of the trail. there was a stretch, maybe 20 meters down, that had absolutely no footholds. i had to lower myself with the aid of ropes, roots, and tree branches of all kinds. i did it painlessly, but the delays multiplied as boots wiped out any places to secure a foot, while rocks kept tumbling down, threatening our unprotected heads. 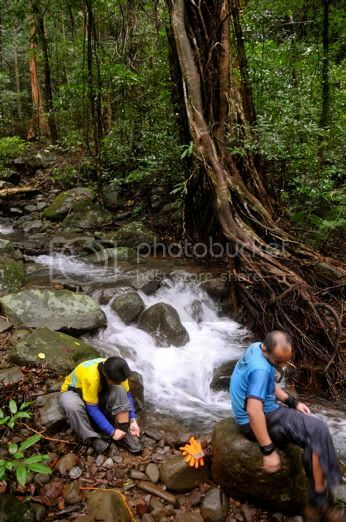 after a while, i found the lead pack resting at the waterfalls, eating lunch. sky was sharpening his bolo with a whetstone. it looked like a scene from "the antipolo massacre", where cesar montano got possessed by the devil and started to hack his family to pieces. sky seemed very pleased with himself when i told him what we had just done was insane. and i could tell because all the trainees who trailed me arrived few and far between. at the SCAJ waterfalls, i stayed for an hour. i was supposed to wait for my group's sweepers in order to regroup, but decided to resume the trek at 11am after loading an additional 3 liters. our goal was to reach the campsite while there was still sun, and i wanted to make good on that goal. so we went downstream for a few meters, then up through the wispy forest which sky dubbed the blairwitch trail. 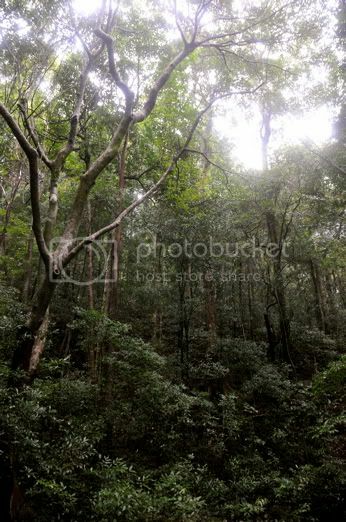 the forest did not resemble the one seen in the movie at all. it may, in fact, been indicative of sky's mental state: demented and possessed. he certainly was in his element in plotting a trail that had neither rhyme nor reason, which spun us around ten times and made us dash blindly towards an unknown destination. the trail was circuitous, and i could imagine sky must have spelled out his name. not his first name. but his last name. i would look out for pink bands tied around slender branches, and would get absolutely riled with the thought that there could have been a shorter route. the forest itself seemed enchanted. 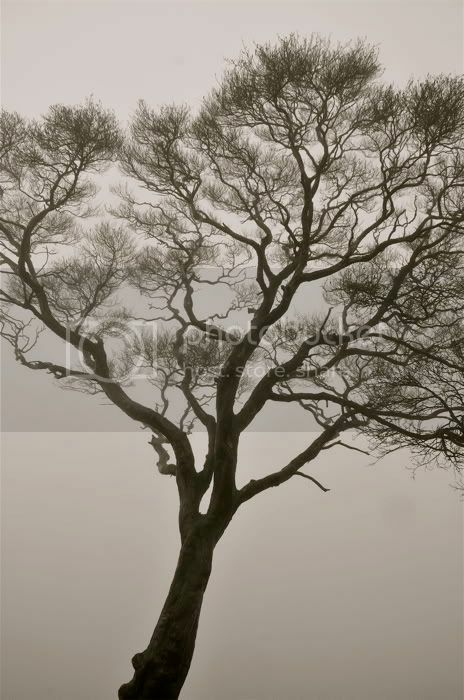 trees were sparse, and the ground was covered in a thick blanket of fallen leaves. barks of grand but dead trees lay on the ground, and were i not grumbling too often, i could probably hear the footfalls of the millions of insects crawling on the earth. it was not even noon yet, but there was this eerie feeling that it was perpetually a shade before 6pm. 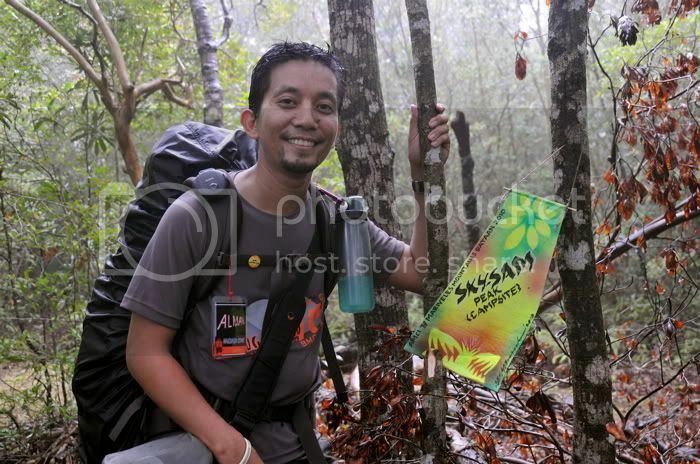 finally we reached the junction, which marked the steep ascent towards tarak ridge. i promised my group we'd be at the traditional campsite in an hour, and magellan's campsite in another hour and a half. the trail towards the ridge has so evolved since the first time i was there. 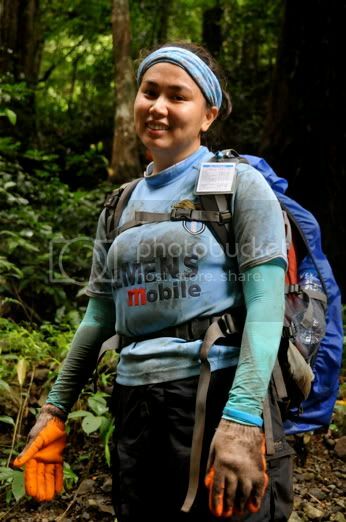 i have been to tarak ridge a total of 5 times, so i know it very well, and can tell how much of the trail has changed, but can still remember the rotten log where i first sat and bewailed my misery. on our way to the ridge, we saw a very brief peek of manila bay through an opening in the woods. i was excited to take pictures up there. but the moment we moved out of the forest and into the slopes teeming with cogon, we found the heavens cloaked in a sad, sombre fog. nothing could be seen beyond 50 meters. it was not even 1pm yet. had the sky been clear, we probably would have spent the time taking pictures. instead, some of us decided to plop down and sleep for the entire 30 minutes we spent there. at 1:30pm, froilan and i decided to forge ahead, and i promised we would be at the campsite by 3pm. going up towards ventana peak, there weren't any trail signs. i only knew this was the way because i had descended the same trail twice. there is a magical quality to the small forest that crowns the ventana peak: it almost looks as if it had been deliberately placed there, the small, slender trees are spaced equally, and the rocks were carefully chosen. on the descent towards the japanese garden, however, i was surprised to find the rocks white, and the tree stumps charred: they looked like burned bony fingers cursing the sky. gone were the bonsai plants that adorned it 5 years ago. gone were the terraces of rocks that made it appear like a place for deep meditation. it was a wasteland filled with soot. it did not help of course that the wind howled and the fog obstructed the view, making it look like we were going down the jagged spine of a mythical reptile. and then, we were swallowed by the forest whole. i knew the campsite was just around the bend, and i looked out for a giant tree. a trainee from another group was ahead of me trekking by herself, while my own group followed me closely. every now and then i would look back to check how they were. they were strong. they were fighters. and as promised, before 3pm, i found the campsite. the lead pack had already pitched their tents and set up their tarps. some of them wanted to make good on the promise to bivouac. although that word is actually a synonym of camp, in these here parts, it has a bad connotation: it means not sleeping in tents, enduring less-than-ideal conditions, equal to misery. i returned to the same spot i found during last year's TC2, imagining where all 6 of our tents would be placed. i was very quick in preparing the campsite, and by the time the others had arrived, we already had a spot for the kitchen, and were already preparing soup. our entire group all arrived before darkness fell, and sherry was beside herself with desperation, and i only managed to calm her down with a hot bowl to sip. 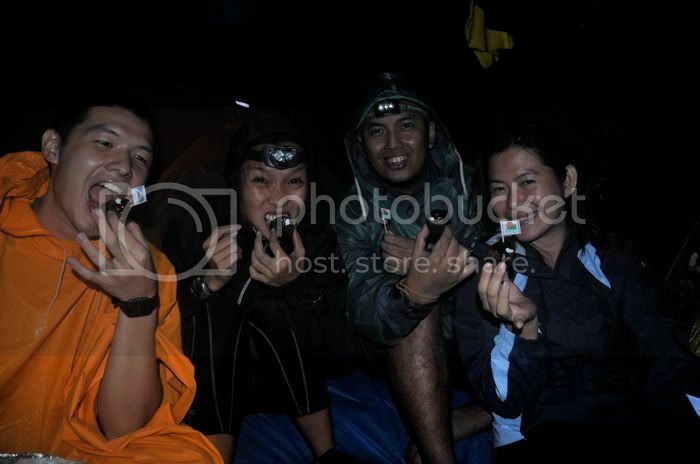 and although it rained occasionally, we still managed to keep ourselves dry while preparing a sumptuous dinner. the trainees prepared beef salpicao while i fabricated a kung pao chicken, en flambé. after eating, joven crawled into his tent, and stepped out with a platter of chocolate beehives for dessert. we had 40 brownies topped with whipped cream and drizzled with ganache. we even had little flaglets on top. everyone loved it. they not only tasted great, but they also showed how much us members valued the climb and our trainees, that we went to such great lengths for them to enjoy the experience. i do not have fantasies of being a gourmand, but i almost always ensure that we eat well in the mountain: it was our reward for a long toil. immediately afterwards, we began our socials. it was a lot of fun, and we got to know the trainees better. but it was unmistakable: while we were all dry and warm and full and bubbling with life despite the hardships, still other groups trickled into the campsite, wet, morose, muddy, bruised, and hungry, hacking out spaces for their tents, settling for even the least ideal of places, giving into exhaustion rather than looking forward to a restful evening. if i could cook for all of them, i would have. i crawled into my tent at exactly 11pm. for the first time in a long time, i actually respected the lights out, because there was no one left to do socials with, and we were all too tired from having started at 3am. the next thing i knew, princeton's guttural voice was rousing me from sleep, and i took no time in getting up to contribute something to the kitchen. we were supposed to be trekking at 7am. breakfast was a breeze, and we focused on the matter of breaking camp. nearly done, nats suddenly appeared carrying a box, and asked me if i had my camera ready. 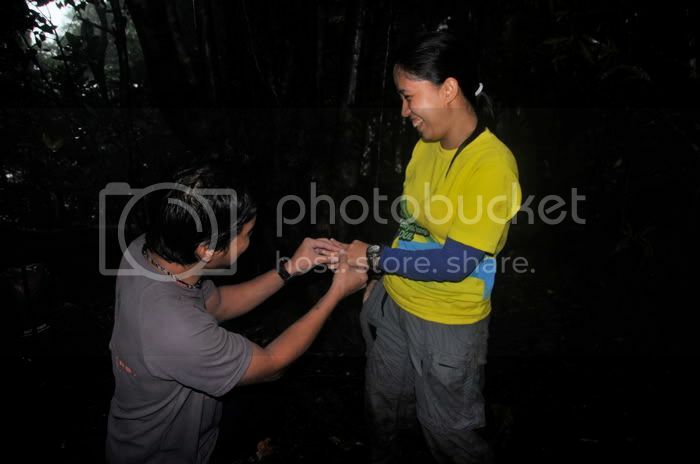 i took it out of my bag and was deliriously happy as he knelt down on the earth and asked neri if she would marry him. she said yes, of course, and without much drama, took out the ring and asked him to keep it. haha. i joked that the wedding plans were already being made long before the proposal. by half past 7, we were eager to start the trek. the lead pack was still just getting packed. the actual trek started at 8am. the magellan trail, wet from the previous day's rains, was a slip fest. and like clockwork, rocks got dislodged every few minutes, tumbling down the trail. one nearly hit me on the head. at the loree-jen stream, we regrouped, and trekked down towards the SLAJJ waterfalls through the papica-jerez boulder, where the view became immediately stunning. blue flowers appeared from the crevices of rocks, and far-reaching leaves of trees fought to provide shade from the sun. 10 minutes away, the SLAJJ waterfalls poured with such fury, the cascades generated wind, we could not go near it. it was still early in the morning, and we were confident about trekking while there was still sun. 10 minutes after the lead pack left, i instructed my wards to load, and they were quickly behind me. it was my job to find the trail, which had us criss-crossing the paniquian river many times. 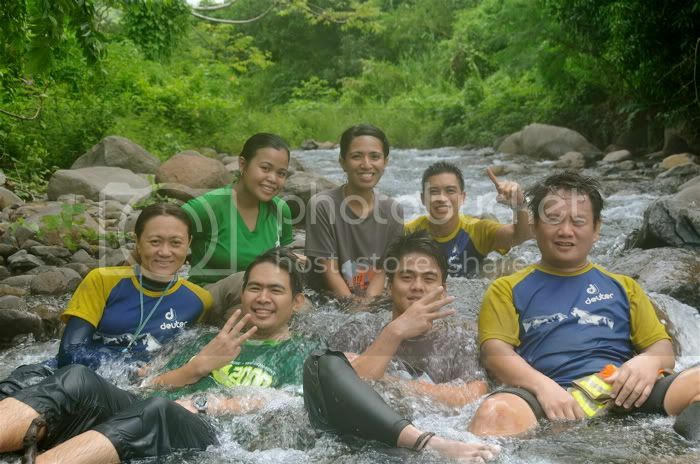 the river looked beautiful and pure, lapping our legs with the life-giving force of the mariveles mountains. i am happy that it is only AMCI which does this trek. 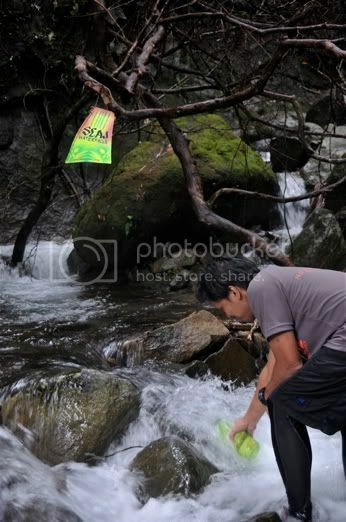 i would not want it to look like papaya river when irresponsible climbers descend upon it. 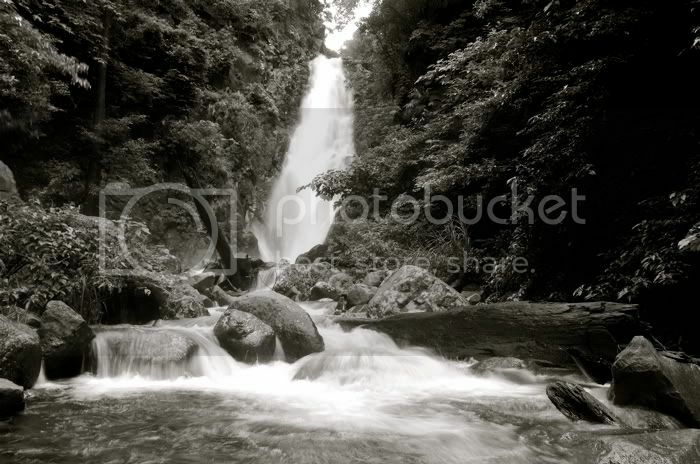 the mountains of mariveles rose steeply on either side, sometimes in sheer walls of rock, other times in tentative forests with its slender trees. we reached the LASBAL junction where the lead pack was having lunch. it was already 11am, and we were barely ahead of the IT. exactly 10 minutes after they left, i instructed my group to load, and we followed their trail up the assault of bataan ridge. then we descended to logger's trail and onwards through the magical forest until we reached the AS-BALL river. all along i was the one making the calls, and my trainees, as well as other members in my group, just confidently and faithfully followed my lead, obeying my instructions to rest as well as my orders to load. i heard absolutely no whining. other than my own complaints, my wards and my companions trusted my judgment calls. from the AS-BALL river, where we camped in 2007, we forged towards the end of the trail, which i suspected would be maybe 2 hours away. TL jepay caught up with us and she informed me it might even be 3 or more hours away. i wanted to shake her into telling the truth. then it dawned on me: in 2007, the entire trek from AS-BALL to the end of trek was our day 2, whereas on this little wicked experiment of sky, it was merely half of it. sky had just tipped the scales of insanity. it did not help, of course, that at this point, there were less and less trail signs: the distance between hack marks increased, and the number of pink strings had dwindled, until there were none at all. i began to worry. if under the bright afternoon light it was difficult to spot the trail, how much more in darkness. instead of spotting trail signs, i studied the trail itself, judging if boots had passed this way, breaking branches so that it would at least show some human activity. 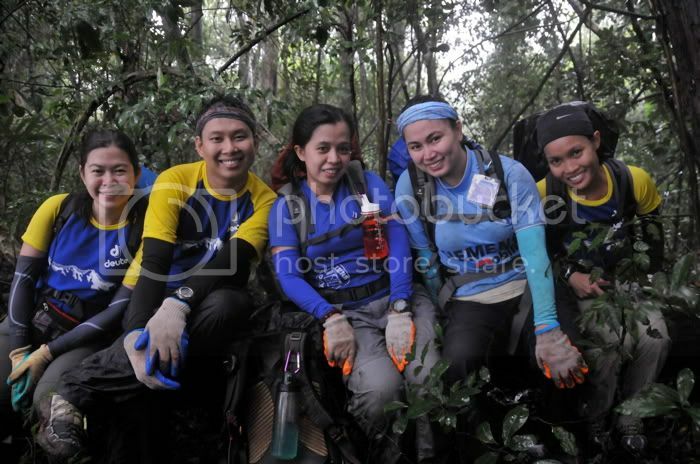 finally, at 3pm, we reached an opening just above mariveles river, and a while later, found the lead pack, resting by its banks. i asked about the strings. they explained that the sweepers were not able to hand over those that had been collected from day 1. there should have been a contingency. 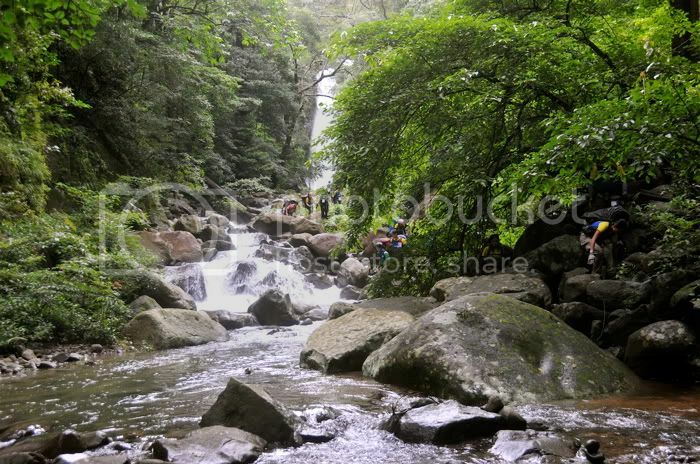 the mariveles river is tiny compared to paniquian or even to papaya. and there is already a community here: charcoal makers have little shacks around the area. there is also a local community trail, which turned into chocolate-colored stream during our trek while the rain poured. it took us just over an hour to reach the crasher site where we rinsed and peeled off the second skin that mariveles had loaned to us for the weekend. it was already past 4pm, and i worried about those who will be doing night treks. i was all too aware of the distance between my own group, and those that fell behind. it was an awareness that did not afford me much comfort. shortly, the jeepney arrived to ferry us to the seashore restaurant, where my first order of business was to purchase 2 cases of beer. at the end of trek, ATL jay-r asked me to buy some drinks, and my reply was: naturally. funny that i would reply like that when not too long ago, i had a policy about beer: i would only drink it if it was free. the night came quickly, but the arrival of our companions was disproportionately slow. by 9pm, our group was already complete, and were heaving praises on each other for a successful climb: the trainees appreciated us members, while the members encouraged them to replicate all the good things they've experienced. we poked fun at our falls, our slips, at the crying along the trail, at each other. we were in very high spirits. this was before we realized that by midnight, we were still far from being complete. the first bus left with nearly half of the contingent. daddy raymond was outside, on a table, contemplating the map, waiting for his wife to arrive. at exactly 12, my friends sang me an uninspired, if not exhausted, happy birthday. i was grateful, but felt something missing. i could not celebrate completely knowing my friends -- people i care about -- were still somewhere in the mountain. there already was a failure in communication, and there clearly was a failure in leadership. we had no idea in what state the sweepers and sweepees were. scenarios played in my mind: was anyone injured? are they still trekking? do they have food? someone suddenly popped the question: would you be willing to go back alman? without flinching, i said yes, opened my pack, and changed back into my trekking attire. yob immediately did the same. but the TL was indecisive. we received no instructions to return, despite our willingness, and our obvious preparedness. in fact, i was so aware of what i needed to do that i had readied my power gels, an extra set of batteries, trail food, and water. but it was not a go. i bugged the climb staff and got nothing but indecisiveness. i decided to sleep knowing anytime i would be called to rescue. but it wasn't until 6am the following day that it became apparent. we had breakfast at jollibee, and i could barely finish one pancake. i had no appetite, but i knew i needed the strength, lest the rescuer need rescuing himself. following that rescue, people thanked me for my selflessness, for thinking of others ahead of myself, for deciding to stay behind on the day of my birthday, no less. but i have to decline the praise. the truth is, and i must confess, i did it out of selfishness. knowing that my friends were still out there somewhere, miserable, hungry, bruised, and even probably angry, gave me little comfort. it left me ill at ease. so i did it for myself. i decided to return to comfort myself. the worry gnawed at my insides like a wild cancer. the rescue was my chemotherapy. i felt incomplete, empty. going back was my way of filling the void. i wanted to have a memorable birthday. seeing my friends far from harm was my present of choice. so we took two separate tricycles which didn't manage to reach the crasher site, and yob, lester and myself, walked with a haste inspired only by worry. from the end of trek, we sped towards the trail without even asking for the TL's blessings. i felt that there had been enough indecision already. i was powered by a sense of urgency, and i was literally running up the trail that yob could barely keep up with me. in 45 minutes, i was already upon the mariveles river where i expected them to be, probably sleep walking, or worse, just waiting for rescue. and just as i was about to cross the river, i let out a scream: it was jovitt, going down with two bottles to fetch water. he looked like an apparition: unbelievable, but shining a light. i was deliriously happy and hugged everyone. dan was moved to tears. they were eating what little morsels they managed to gather from the scraps of their meal plans and emergency food. at least they didn't grow hungry. immediately upon seeing them, my adrenalin had subsided, and i felt weak, not having eaten so well. but finding them was nourishment in itself. i was happy. i felt accomplished. i felt relieved. i was selfish, not selfless. the bivouac site was the area with the little rundown shack where many of the stragglers slept. they were already so tired from having trekked an excess of 18 hours, and couldn't find the trail sign immediately after the river. this was between 1 and 2am. if we had been dispatched at midnight, we would have actually met at that same spot. i had no desire to engage in blamestorming, but i hope everyone here learns a lesson from this episode. i chewed on these lessons as we made our way back to seashore restaurant, and cleaned up for the commute back home. reflecting on sky's one-off trek, i was reminded of his mantra: that to climb a mountain is to feed the visual needs of the soul. part of me wants to say that only a tormented soul would want to do something as insanely long and derangedly difficult as this year's climb. but then again, as i had pointed out at our post climb meeting: this was after all, a training climb. it is designed to expose you to the worst things that might happen on the mountain. in so doing, it prepares you for long hours on the trail. it makes you stronger. it develops all the right values in you: patience, perseverance, courage. it wasn't danger for danger's sake. i do not think the club exposed anyone to unnecessary perils. all those technical portions were placed there for a reason. they were calculated risks, sufficient to develop skills, but not impossible that they might lead to tragedy. yes, there may have been slight miscalculations, but then it probably boils down to a difference in opinion, and a disparity in experience. that we are all back on the plains, despite the bruises, cuts, scrapes, bumps, and bites, only means that we will have to make a choice: will this climb make you, or break you? i hope they find themselves made.